9197 Private Matthew James McAnary M.M. James McAnary was born and lived in Desertmartin, County Londonderry. 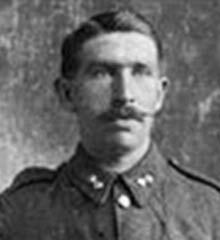 He enlisted in Cookstown and served with the 1st Royal Inniskilling Fusiliers. He was killed in action during the battle of Cambrai on 30th November 1917. Private James McAnary M.M. has no known grave and is commemorated on Panel 5-6 of Cambrai Memorial. He is also commemorated on Castledawson War Memorial. 7 Private Robert Irwin M.M. Private Irwin won a Military Medal as well in the same incident.